Ancient warriors, generals, battles, strategies, tactics and wars. The Aztecs, Celts, Chinese, Egyptians, Greeks, Germans, Slavs, Spartans, Indians, Incas or any other ancient peoples. We may post relative information about ancient military history on our site. Please don't send us any spam though, we don't like spam at all. 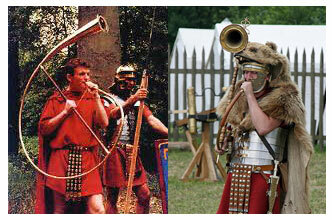 A Roman Cornu (Horn) was a curved trumpet used to communicate coded orders across the chaotic ancient battlefields. The Cornu was carried by the cornicen (horn-blower) and used to coordinate the Roman military.